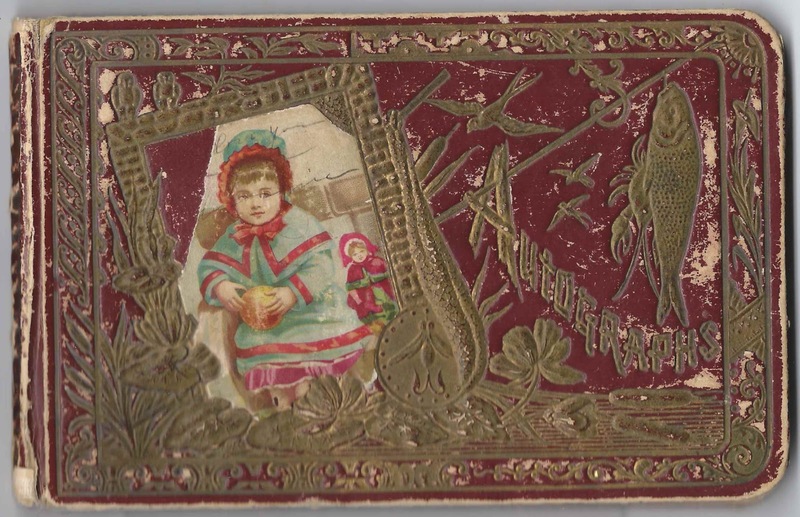 1890s/1900s autograph album of Addie C. Harris of Springfield, Missouri. 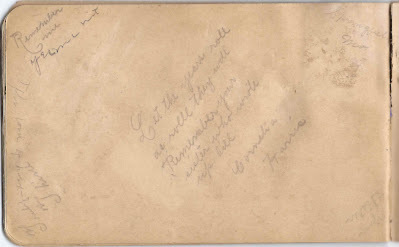 The album, in fragile condition, is approximately 7" x 4-1/2" and contains the sentiments of 26 people, some of whom wrote on two pages, in addition to a loose Victorian scrap with the name Emeral Gates on it. An alphabetical list of the signers appears at the end of this post. 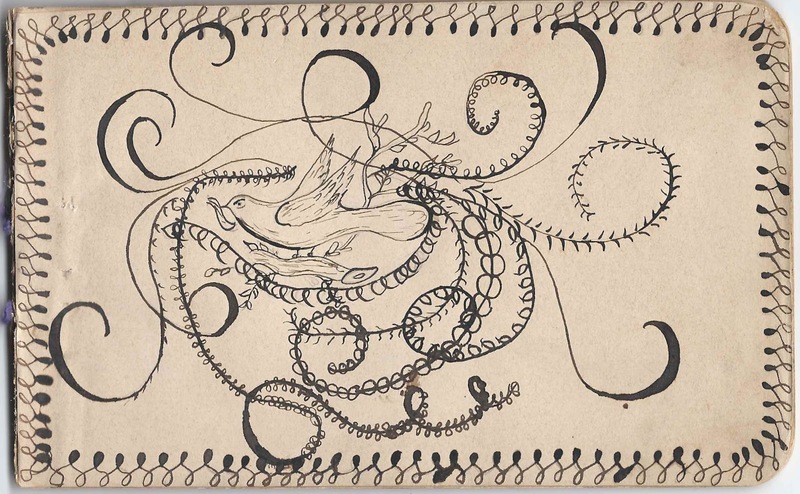 It's possible that some pages at the beginning of the album are missing, as there's no title page, nor is there a page that Addie inscribed herself, though it's tempting to think that she might have sketched the intricate design above. I've had a hard time finding information on Addie, except for 1903 and 1904 Springfield, Missouri directories showing her as a dressmaker at 823 w Mount Vernon. Sharing that address were dressmaker Cornelia Harris, dyer Frank E. Harris and shoemaker John W. Harris. One of the signers, Cornelia Harris, indicated that she was Addie's sister. Cornelia died in 1907. Frank E. Harris was Addie's brother, Frank Edwin Harris (1879-1962). John W. Harris was her father, a native of Georgia, who married Mary R. Gaston about 1882. The 1900 Census of North Campbell, Missouri, lists John W. Harris, his wife Mary, and children Frank, Cornelia, Nellie, Joseph, Fred and John. Addie wasn't listed with them. She may have been the oldest and then out of the house. John William Harris' 1930 obituary lists two daughters who survived him, Mrs. L. L. Rhodes and Mrs. John Carried. Nellie married Elmer Columbus Rhodes, so perhaps it was Addie who was married to John Carried - though the name could be a typo. Hopefully a reader will leave a comment solving the mystery. If you have more information on Addie C. Harris of Springfield, Missouri, or any of the signers listed below, please leave a comment or contact me directly. Thanks! 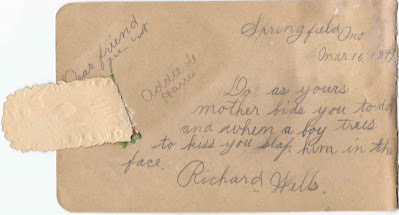 Richard Wells signed two pages in the album, at Springfield, Missouri, on March 16, 1899. 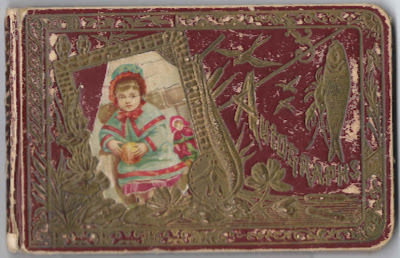 One of them, shown below, featured a Victorian scrap partially pasted that, when lifted, revealed the name Addie C. Harris written on the page beneath. It's possible that Addie wrote this herself. 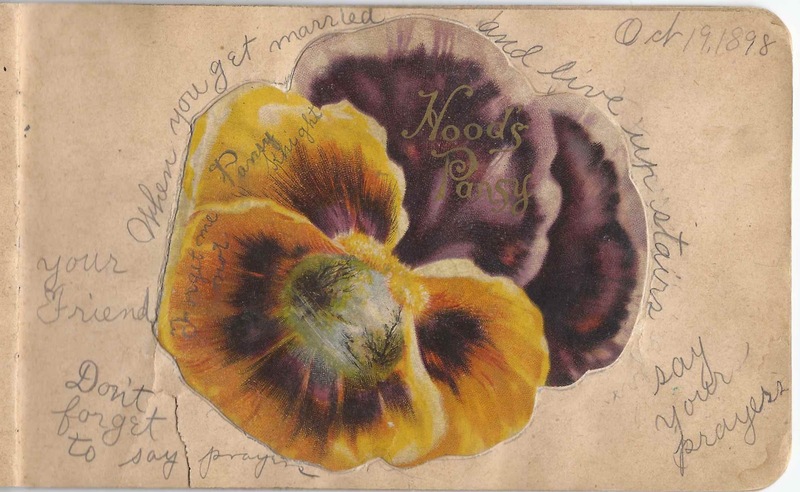 Another page of interest was that of Pansy Knight who fit her inscription of October 19, 1898 around and on a Victorian scrap of a pansy. 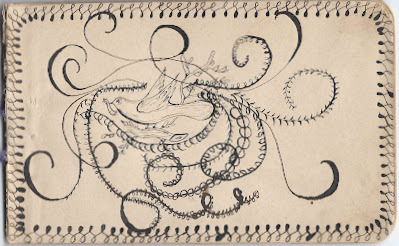 Lillie May ?, signed at Springfield, Missouri, on February 23, 1892. Possibly Carmar or Cavnar or ? Minnie Brown, signed at Springfield, Missouri, on April 9, 1900. Box 374. 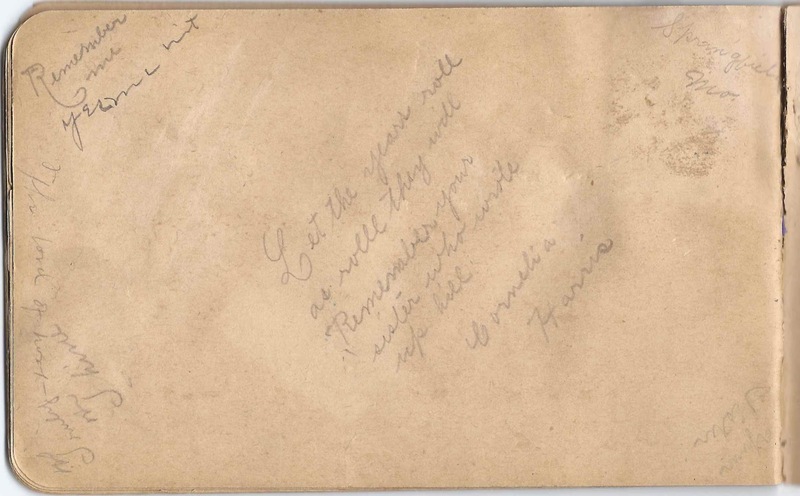 "Remember the Maine"
Lizzie Hall, signed at Springfield, Missouri, on November 29, 1898. Inscribed to "Miss Addie Harris"
Pansy Knight, signed on October 19, 1898; appropriately, she pasted a large Victorian scrap of a pansy on her page and wrote around and on it. Bert Mann, signed at Springfield, Missouri, on March 16, 1899; he signed two pages in the album on the same date. 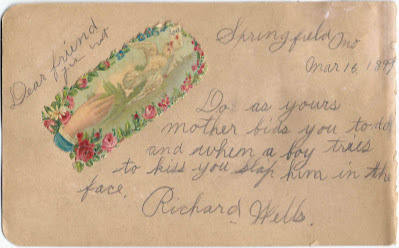 Rich Wells, signed at Springfield, Missouri, on March 16, 1899. 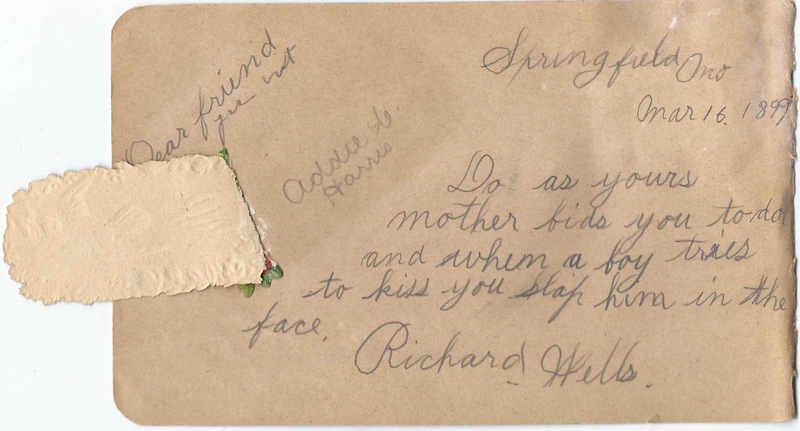 Inscribed to "Miss Addie Harris". Later on in the album, he signed a page at Springfield, Missouri, on March 16, 1899. This page has a Victorian Scrap on it that, when lifted, shows the name Addie Harris written on the page itself. I thought the name Addie Harris 'rang a bell' so checked my tree. I do have one, but 'my' Addis's father was James Benjamin Harris. :) But, at least I am recognizing names on my tree! Addie was married my grand uncle. With any luck at some point, we'll connect some names!